School closures for inclement weather sometimes seem like a no-win situation. School officials get flak for both decisions -- closing and not closing schools -- when bad weather occurs. Stories of students stuck at school or on buses for hours because weather conditions worsened more quickly than expected can go viral on social media and in news outlets. Or, perhaps more often, parents are frustrated that their kids are at home on a day when a bad forecast never arrived. This is where communications and community engagement are key. Parents need to know that the school district is prepared to handle any kind of weather crisis -- whether it be snow, floods, hurricanes, or fire -- and that their children are safe. Make sure your inclement weather policy works. It’s a good idea to review policies and communications methods annually or periodically, as communications strategies evolve quickly and more or different channels may be needed. Engage your community to give input. Publicize your methods of determining whether to open or close schools. Emphasize that safety is paramount, and show empathy for families and school staff who are dealing with disruptions. In the first days of school, send home a flier or brochure that details the district’s inclement weather closings with students’ backpack mail. Send another copy home at the start of snow season, or tornado season, or before any other period that could spur school closings. Many school districts have web pages that explain how they determine whether to open or close schools. Here’s an example that we like of an informative and empathetic web page that explains how the Blue Valley School District in Kansas determines its closures. This website outlines how the decision is made, who makes it, by what time of day, how parents are notified, how a snow day affects the school calendar, and parents’ rights to keep a student at home if they choose -- in essence, everything a parent needs to know. Social media has been a game changer for inclement weather closings. After all, if parents and students are stuck at home and still have power, it’s all too tempting to go online and vent. In January 2015, Washington, D.C.-area school district officials were lambasted on social media for making a bad call when the region was caught off guard by a morning snowstorm that snarled traffic and infuriated parents and students. Three school districts (Montgomery, Howard, and Prince George’s counties in Maryland) made late decisions to close or delay opening, resulting in confusion. By midday, three large school districts that stayed open (Virginia’s Fairfax, Loudoun, and Arlington counties) had apologized for not closing schools. Another district, Anne Arundel County in Maryland, was dealing with a public relations crisis after two high school students were critically injured in a weather-related car crash on their way to school. While the board member took the joke in stride, even posting the photo on his own account, the lesson for school administrators should be, don’t ever underestimate the power of social media -- or the creativity of your students. On days where it may be necessary to close early or make a last-minute decision, have a staff member closely watch the weather forecasts. The good news is, meteorology has advanced in recent years and forecasts are becoming more accurate. 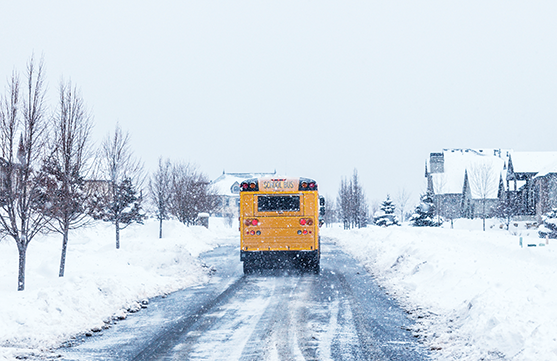 Follow your district’s communication plan to broadcast inclement weather or emergency closings. Parents, employees, and other stakeholders should know when to expect information and where to find it. Once a decision is made, use a variety of media and technologies (text/phone alerts, email, website, social media, and news broadcasts) to get the word out. In this age of social media, it is particularly important for school districts to have a designated staff member monitor, engage, and respond to suggestions, comments, and concerns. Without response -- especially when there is a crisis or a community concern -- parents, students, staff, and the community feel like they are being ignored. This can provoke even more negative postings that easily can go viral and damage a school district’s reputation and communications efforts. A Bad Call -- Now What? Every school district should have a crisis communications plan. Follow this plan if an unexpected event result in negative publicity for the district. In addition to internal channels, use media and social media to reach parents and the community. Designate one spokesperson, or ensure that all spokespersons -- administrators, school board members, etc. -- have received talking points and are speaking with one voice. A “no comment” or refusal to return calls from media is damaging. Apologize if it’s clear that a mistake was made, and use the opportunity to reiterate your inclement weather policies. In addition, in announcing weather-related closings or in anticipation of bad weather closings, Fairfax County sends emails reminding parents of the district’s inclement weather closing policies. Each closure announcement usually has a sentence or two explaining the decision. One caution about communications, though, is that too many emails or social media posts can backfire, and end up being ignored or overlooked. Going forward, if there is fallout from a bad call on a weather-related closure, do not let that impact future decisions. Evaluate each closing situation individually. Transparent policies and clear communications channels will help rebuild trust with your parents and students. However, if you are getting a number of complaints, or specific complaints in one area, consider revisiting your policies with community input. Joetta Sack-Min (joetta@k12strategies.com) is a managing partner of communications consulting firm K12 Strategies and a former associate editor of American School Board Journal. K12 Strategies Founding Partner Laurie Hart contributed to this article. Virtual learning can help ease long stretches of school closures and keep students engaged -- with or without technology -- through assignments either sent home in backpacks or accessed through the internet. Districts such as Pascack Valley Regional High School in northern New Jersey are using virtual school days that continue learning even when students and teachers can’t make it to school. When snow is in the forecast, teachers are alerted by the superintendent to develop lessons that could be completed at home. A day later, students log in on school-provided laptops and are able to ask teachers questions, work through assignments, or participate in class discussions. In other districts such as Township High School District 214 in suburban Chicago last year, teachers voluntarily put assignments online and students voluntarily completed those assignments on school-issued iPads. To avoid the problem of not having access to Wi-Fi at home, students were encouraged to download the assignments before they left school the day before a snowstorm or when below-zero weather was predicted. In some classrooms, as many as 98 percent of the students completed the work. Other school districts such as Kearsarge Regional School District in New Hampshire have implemented a program called “Blizzard Bags.” Students have the opportunity to learn at home when it is necessary to close the school due to inclement weather or any other reason.